When you're a child of four, you do everything with your brothers and sisters. You play together, you eat together, you even get haircuts together. And, if one of you is due for a dentist appointment, all of you are. There needs to be an order behind the madness. I mention this because someone at my dentist office - I don't know who - set up an N64 in the waiting area for kids. There were only two games for it, Pokémon Snap and Rampage World Tour. 6-year-old me loved Rampage; the wholesale destruction of buildings, the murder of innocent civilians - it was perfect. At home, I could enjoy Banjo Kazooie but it was nothing like Rampage. Banjo collected puzzle pieces and Jinjos. George, Lizzie and Ralph ate people. Little did I know that there would be a Rampage movie at some point. Little did anyone. I wonder what 6-year-old Drew would've thought of Rampage. Well, I have the next best thing. I know what adult Drew thinks of Rampage. It's routine. 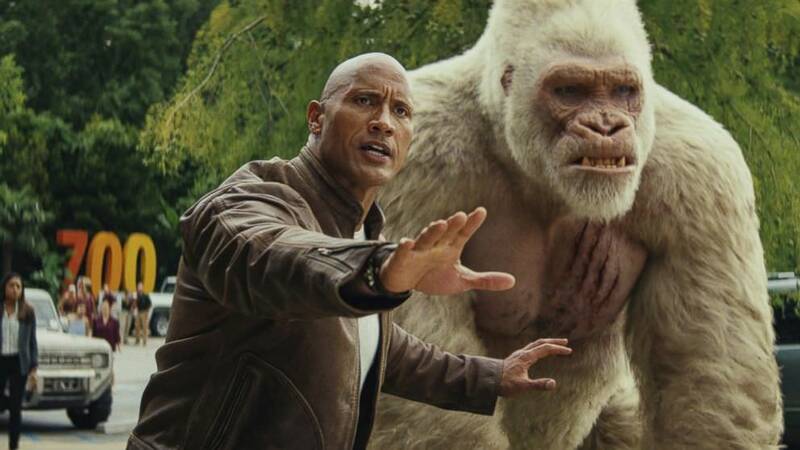 Rampage stars actual boulder Dwayne Johnson as Davis Okoye, a primatologist who's formed a fraternal bond with George, an albino gorilla that Okoye has looked after since infancy. When George is inadvertently exposed to a genetic-altering substance, things start to change. George starts to grow, and Okoye starts to worry for his gorilla-bro. As the situation soon gets too big (heh) for Okoye to handle, he utilizes the help of Dr. Kate Caldwell (Naomie Harris) to save George, as he's not the only creature that's grown as big as a building recently. The plot isn't why anyone is seeing Rampage. People want to see things get destroyed by big monsters. With any luck, buildings will go down in such a cavalier and entertaining manner that it'll be worth the price of admission. You know what? Those people are right. 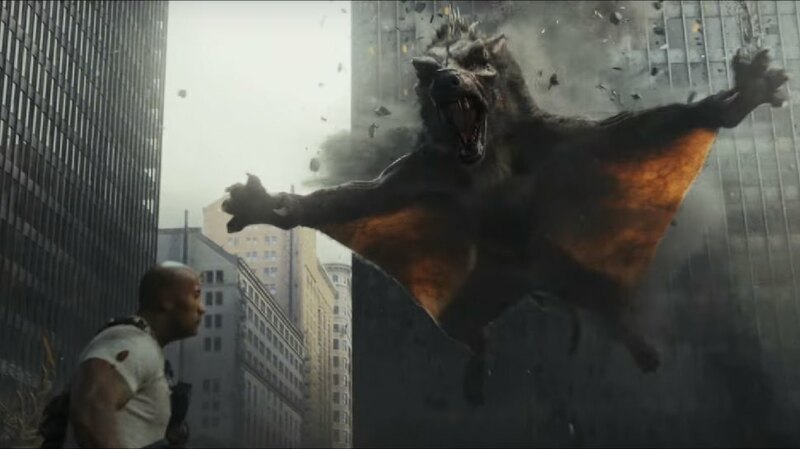 Rampage isn't concerned with the lives of the people in the city, it focuses in on the spectacle of big monsters tearing through a metropolis in a cartoonish, well, rampage. Thank god! I was concerned that there wouldn't be any of that. Rest assured, Rampage sure does rampage. But not enough. At least for me. Rampage is still a movie after all, and it needs to provide some explanation for why these giant monsters are rampaging. And also, why there are big monsters. Unfortunately, the explanations for the rampage linger on screen for too long. There are a few strokes of humor that are worth the break, but aside from that, and the necessary exposition, the remaining screen time should've been dedicated to more fighting -- not villainous corporate people metaphorically twirling their mustaches from the shadows. In fact, there should have been little to no focus on humans - at all. I know, I know, we need those damn humans to empathize with, right? WRONG. Better yet, I can prove it! People like animals more than humans these days. Furthermore, George is a more sympathetic character than Dwayne Johnson's character is. George may roar a lot, and smash into quite a few buildings (at least four) but early on, his sweet facial expressions when laughing, or feeling regret, or being scared, made me feel so much for the big guy. He doesn't know what's happening to him, he's scared. George should've been the main character. I apologize for that tangent, but it's necessary. I'm not sure what else to talk about with Rampage. It's a big, dumb blockbuster that's been adapted from a recognizable name into a movie that vaguely dons the visage of the source material. I will say this, that visage looks darn fun. The designs for George, Ralph, and Lizzie are appropriately ridiculous and entertaining. Ralph in particular is intimidating, cool and disgusting all at the same time, without feeling too real or too fake. When these monsters are punching and biting and clawing each other, it looks good. But there isn't much else to Rampage. There's some humor here and there, sure. There's The Rock -- as charismatic as ever -- but as expected, he's just being The Rock. There's big monsters hitting each other on screen, but we've all seen this before. In this day and age, blockbusters need to do at least one thing exceptionally well, besides the action. Rampage isn't as clever or tongue-in-cheek in the same way that Jumanji: Welcome to the Jungle was. It doesn't have the heart and the characters that Pacific Rim had. Rampage has a name, and that's about it. Rampage is exactly what you think it is. It doesn't take its plot seriously, but it doesn't take its aim to please the audience seriously either. Rampage is a lot like Pacific Rim:Uprising, another film I reviewed recently. There may have been an attempt to make a dumb movie into something more. But it doesn't show. In both cases, you're better off experiencing the original.